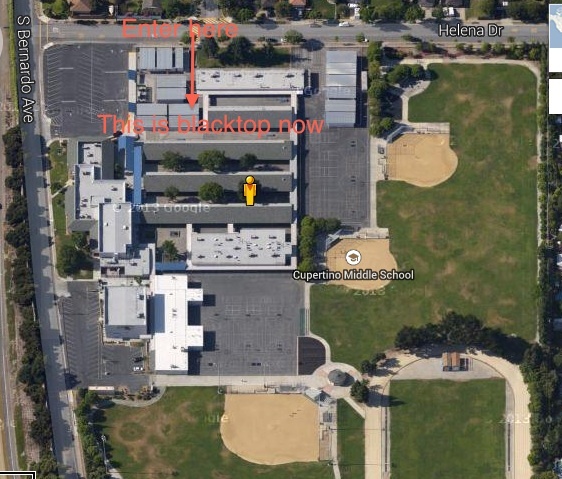 Starting November 1st, 2014, SickFit Bootcamp will be permanently back to its original home, Cupertino Middle School. There is a brand new blacktop and awesome facility for Sunnyvale's Premier Outdoor Bootcamp. Every Monday/Wednesday/Friday, SickFit Bootcamp will have bootcamp fitness classes on the blacktop at Cupertino Middle School from 5:45-6:45am. Also, most Saturdays there is a 75 minute bootcamp class at Cupertino Middle School from 7:30-8:45am. You want to enter the bootcamp from Helena Dr. There is a large gate that will be propped open leading you straight up onto the basketball court blacktop area. See the picture below that has arrows indicating where to enter the bootcamp. Bring a yoga mat or exercise mat, water and a towel (if you feel you need one). If you have your own jump rope that you like to use you can bring that as well. Everything else will be provided. Mondays will be bodyweight focused. For this bootcamp there will be numerous challenges and formats aimed at bodyweight exercises. Wednesdays will be strength and toning. Most strength and toning days you will bring your dumbbells and we really focus on specific body parts. Fridays are focused on full body circuit training with a lot of different types of equipment. ALL LEVELS ARE ENCOURAGED TO PARTICIPATE. WORKOUTS WILL BE MODIFIED FOR ALL FITNESS ABILITIES.